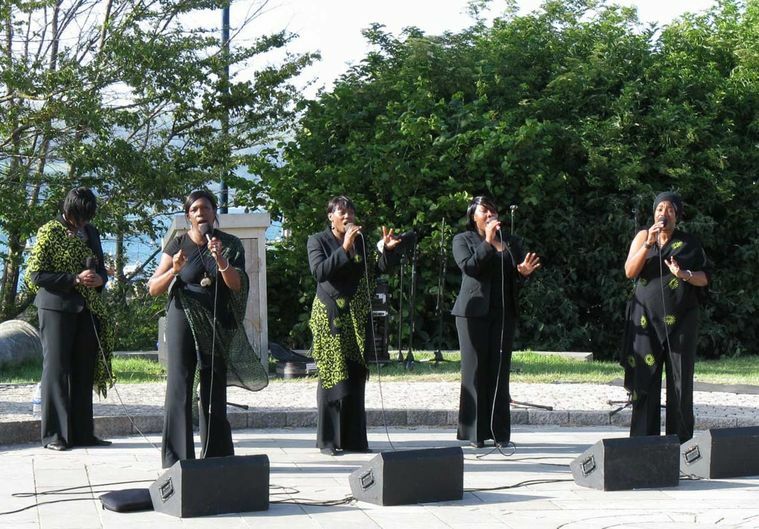 There was great cause for celebration on Saturday 28th June when the sun shone on a wonderful performance at Swanage Amphitheatre, with singing from the exhilarating Causasian male voice choir, Mtiebi, and the world-famous a cappella group, Black Voices, acclaimed ambassadors for Gospels and Spirituals, Caribbean and African, jazz and blues singing styles. They were joined by a massed regional choir of around 250 singers from 5 counties in the South West who sang the world premiere of the specially commissioned 'Celebrate', composed by Sara Colman, who was there to direct the choir herself. This concert marked the culmination of an Arts Council-funded project entitled ‘Singing Out West’, in which Black Voices led singing workshops in rural communities in the South West, which were then continued by vocal specialists and choir leaders to teach participants 'Celebrate' to be performed on this day. 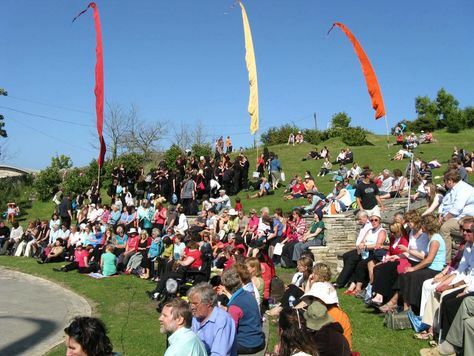 During Saturday afternoon, individual regional choirs sang throughout the town, filling Swanage with music and drawing around 1000 people to the Amphitheatre for a finale performance. A festive atmosphere filled the spectacular open-air venue, which was encircled to stunning effect with Balinese ‘Umbul Umbul’ celebration flags. 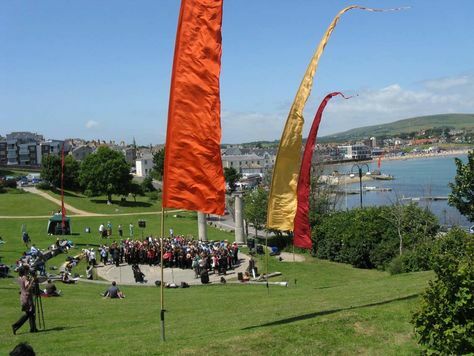 Crowds gathered with their picnics to bask in the sunshine and enjoy the top quality free live music, with the sea as the backdrop. Artsreach would like to thank the huge audience who attended the event and so generously donated to the collection. This concert formed the culmination of a regional project organised by Singing Out West, an innovative music partnership project taking place throughout the South West region, running from February to June 08. It involved six Rural Touring Schemes in the South West; Carn to Cove, Villages in Action, Beaford Arts, Take Art, Artsreach and Air in G. The project was financed by the individual schemes, along with additional funding from the Esmee Fairbairn Trust, via the National Rural Touring Forum, and the Arts Council.